It's March! Where did time go? I had such a crappy day today but I thought it's just one lame day out of 365 better days. So many places, so little time. February was such a busy month for me at work. 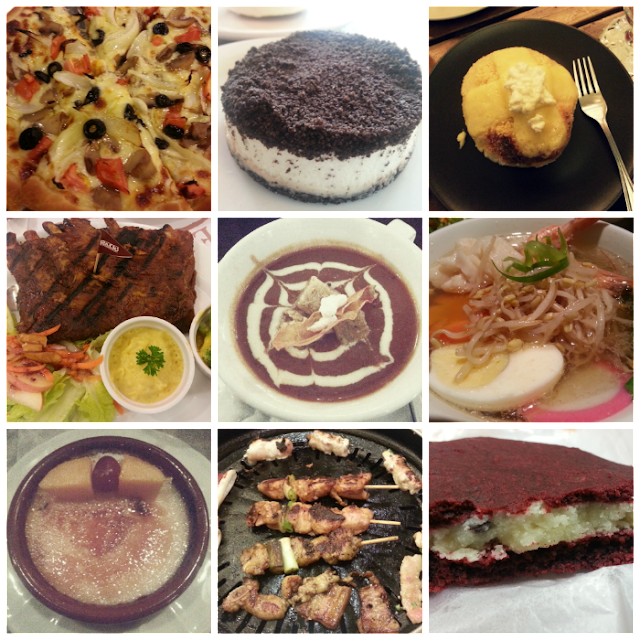 I have no spare time to post more about food (or about anything else, for that matter). I'm still getting accustomed to my new work schedule and I had to adjust some things so I can function well at work. I have this list of things/topics I want to blog about but I was swamped with work and I just wanted to sleep when time permits. Let me give you a rundown of some new treats I've tried the past month (maybe including the last week of January, I forgot). Anchovy Lover's Pizza from Don Henrico's. A friend picked this one and let me just say... I never really liked anchovies. Oreo Cheesecake from Jay-J's Inasal. Jay-J's is our place of comfort after a hard day at work because we just love their Kare-kareng Gulay and Sizzling Lechon. Their version of this dessert is still pretty decent compared to others. Might be a tad sweet for others. Three Cheese Ensaymada from Cafe Mary Grace. Too much of a great thing (cheese) is sometimes... not that good. Kansas City Style Baby Back Ribs from Racks. No words to describe how fantastic this is. It's been ages since I've been to Racks. Meat is so tender and it really falls off the bone. A must-try! Thick Tomato Soup from SLICE. I ordered this along with their Seafood Puttanesca. Both were good, the pasta had generous chunks of salmon and shrimp, and the tomato soup was really a feel good food dish. It felt comforting and homey. Great resto, Ms. Cayetano! Tanmen Ramen from Teriyaki Boy. Ramen craving because of Ponyo + a long day at work = stress eating. I never really frequent Japanese food chains so I don't have any sorts of expectations. I thought it was flavorful and filling! Creme Brulee from Larry's Cafe. We found this posh cafe in Serendra and decided to have coffee and desserts there. I just wished it the colors popped a little bit more. A little more burned caramel on top would have done justice to the taste of this sweet treat. I especially loved the fresh mango on top. Buffet at Yakimix. Went here with Fritzie. Girl bonding means gluttony. Yakimix - 1, Trish - 0. Red Velvet Cheesecake Cookies from Sophie's Mom. I think this is better than the Red Velvet Cookies with Cheese Cream frosting because the cream cheese was inside the cookie. I don't know if I'm making any sense there. Whew. That was quite a long list. Here's to hoping that the rest of March would be kinder! Cheers!